Reserved for designers, 21 years of age or younger, this category places no limitation on media used and requires only that the finished piece is wearable jewelry adornment and fabricated by the entrant. 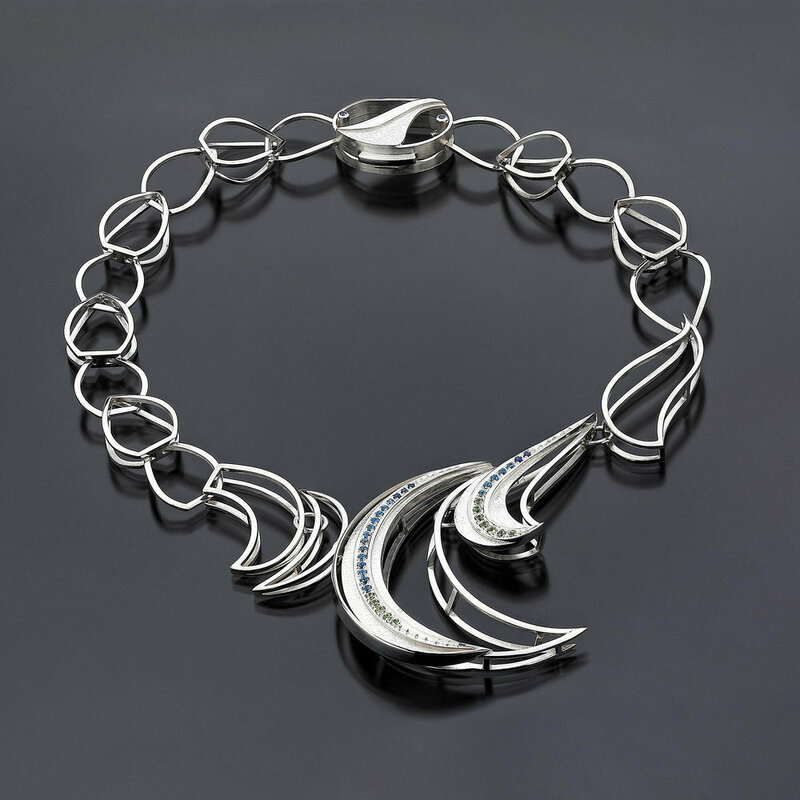 Artist Statement: Inspired by the lightness and imposing character of tropical birds, this necklace was constructed in sterling silver. The front highlights a pavé of 12 peridots, 18 blue topazes and 5 blue sapphires set on a rolling mill impression, while the hinged clasp features two bezel-set sapphires. Artist Statement: Designing pieces, shapes and lines that are at once structured and clean is an exciting challenge for me; I tend to apply this to most of my creations. This obsession with order often guides me towards movement and functionality in my pieces—whether it is in the movement of the body, the materials or the lines. Artist Statement: "A Gothic Melody" was inspired by the ornate architecture of Gothic cathedrals. It was hand-fabricated from silver wire and tubing and features traditional chain-making techniques, as well as blue topaz, and diamond accents.